Last week a deal was announced between ActewAGL and Better Place Australia, to ensure electric vehicles in Canberra will be powered with electricity from renewable resources, such as solar or wind generated power. 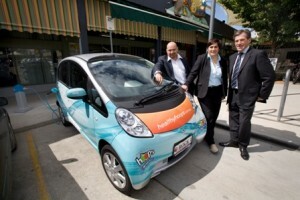 This means that using an electric vehicle in Canberra will have the smallest possible environmental footprint. We’re really excited with every step closer Electric Vehicles take to become a reality. Electric Vehicles are perfect for Canberra, because we make so many short journeys – a charge spot will never be far away. Better Place is currently working on installing charge spots and other infrastructure all throughout Canberra so that the network is fully operational by 2012. loop already has a charge spot installed and several more will be installed as the development progresses. Rock Development Group also has charge spots at their office and at some Directors’ homes. When the network is operational in 2012, Canberra is set to be only the third city in the world to fully support electric vehicles.